how to replace it and what you should do if its opening on its own. and tpr valve (temperature pressure relief) valve. Water expands as it is heated. relief valve to relieve the pressure. 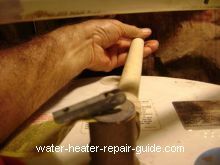 Watch a water heater explosion when the pressure relief valve fails. Why is water slowly leaking out of the relief valve discharge (drain) line? Relief valves will release water slowly if their is to much pressure in the tank. This happens on closed water systems ( check valve somewhere in the system). 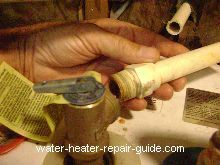 First replace your relief valve if it is an older one. 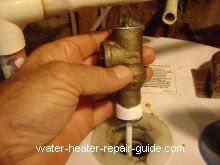 If the new valve is allowing water to leak out you may need to install an expansion tank on the cold water inlet line near your water heater. Expansion tanks are designed to absorb the pressure from your water heater. The water pressure regulator valve may be at fault. Why is my relief valve sporadically releasing large amounts of water? This happens when the valve is opened because of high temperatures. be warm near the valve, this is normal. If the line is hot the relief valve is opening. out the relief valve drain line. twice a year to be sure its working properly. 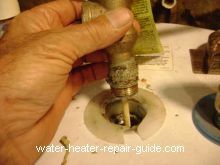 Electric water heater - turn the water heater breaker off. 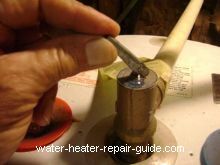 Gas water heater - set the temperature knob to its lowest setting. Turn the control knob to the pilot setting. 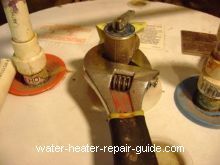 Turn the water supply off at the water heater. Open the nearest hot water faucet to relieve the pressure on the tank. drain the tank until the water level is below the valve. If the relief valve is mounted on top of the tank your ready to start. attached to the relief valve. Remove the old relief valve. and install the new relief valve. Reinstall the valve drain line. all the air is out of the line. Check for leaks. Electric water heater - turn the power on. 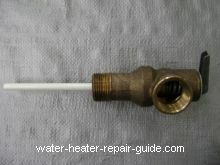 Gas water heater - set the control knob to the on position. Turn the temperature control knob to the normal setting.